These kits are available in stainless, black, water blue, cherry red, and pearl white. The pricing ranges between $33 and $38 online. Up to $55 in most brick and mortar stores. 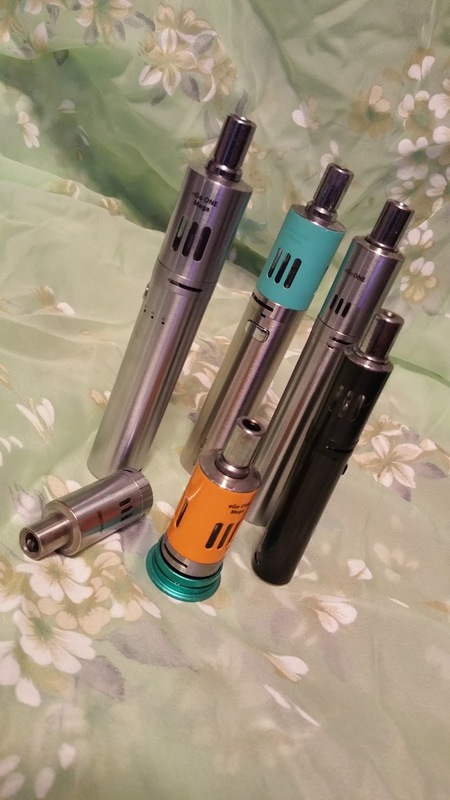 All of them can use eGo ONE CL coils available in 1.0 Ohms or .5 Ohms, or the CLR coil head which is easily rebuilt. The coil heads are VERY reasonably priced at around $13 per five pack. That price also covers a five pack of rebuildable heads. Most RBA decks will set you back that much for just one piece! The kits I received all came in a decent presentation box with cables, extra coils, a manual, and a wall wart. In the box, the device is mostly assembled with a coil in the tank, but the tank is not fully screwed on so that if the device is accidentally fired when taking it out of the box, the coil is not immediately fried. All of the models feature micro USB charging ports on the side of the device and passthrough capability. Although they have the capability, I do not recommend using it as the batteries can become quite warm. On the bottom of every tube, there are engraved certifications and a single vent hole. 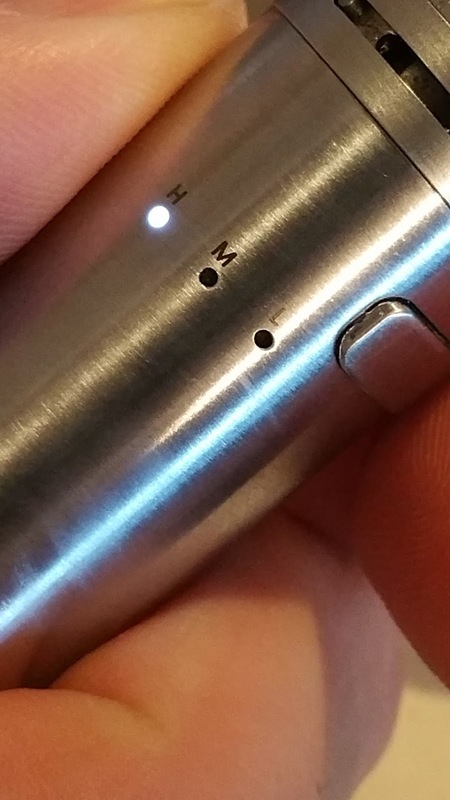 On the side, just above the micro USB port located towards the base of the battery tube is a small Joyetech logo. On the other side, again towards the base, is the device name. Note that the eGo ONE XL just says eGo ONE. All of the others in my collection have the full device name i.e. eGo ONE VT or eGo ONE Mega. 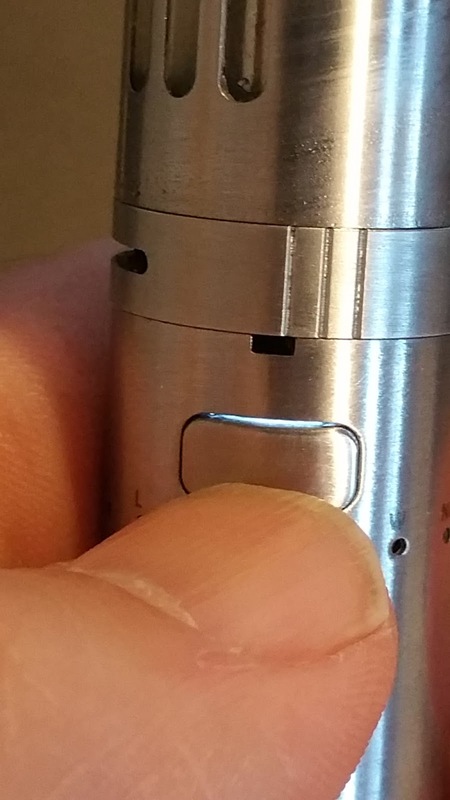 All of the tanks have standard 510 connectors with no protruding center pin and so they are obviously not suited for hybrid mech mods. They are steel over glass tanks, quite sturdy, with vertical slits for checking e-liquid levels. On the later models, the windows are much larger. The original units had very small windows and it was difficult to determine how much e-liquid was left. They are all bottom filling tanks. The larger models are quite easy to fill, but the smaller units are a bit tougher as they have very little space between the edge of the tank and the edge of the interior chimney. For filling the smaller models, I recommend dropping the e-liquid onto the threads at the base of the tank with the tank held at a slight angle and letting the juice flow downwards. It sounds like a pain in the rump, but as the smaller tanks only hold 1.8 to 2.5 ml, it doesn't take too long... between 35 and 55 drops, or about 2 to 3 droppers full. The tanks originally came with two mouthpieces - a metal version and an "organic glass" version. I have no idea what organic glass is, but it did not appear to be plastic as it never took any teeth marks. I have not seen any of the later kits with the glass mouthpiece. All of the tanks have adjustable airflow that can be closed off to allow for tight mouth-to-lung vaping and a restrictive direct-to-lung inhale. The eGo ONE CT has some additional LED lights. There is an array of lights under the fire button. They are marked W (Wattage mode for use with Kanthal coils), Ni (for use with temperature control nickel 200 coils), and Ti (for use with Titanium temperature control coils) and will light up white, blue, and red respectively. To switch the device between the different modes, turn the device off and press and hold the fire button to switch modes. Make sure that the right coil for the right mode is installed. 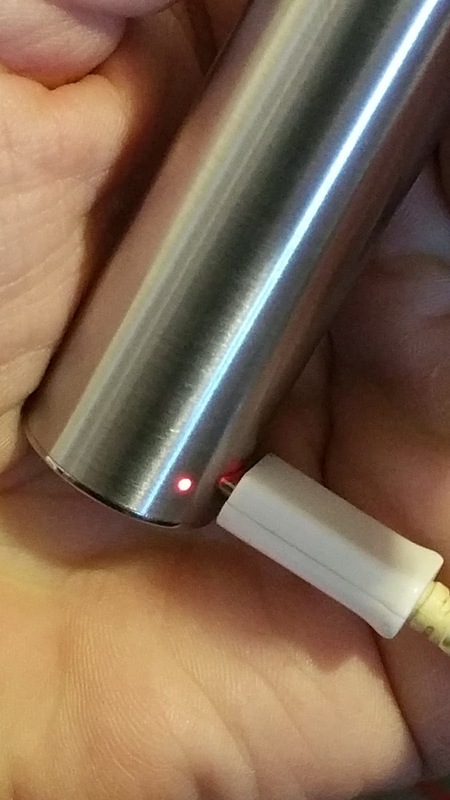 It is not wise to vape Ni200 or Titanium in wattage mode. When in Ni200 mode, the device is preset to fire around 470-degrees Fahrenheit or 245-degrees Celsius. In wattage mode, the device delivers between 7.5 and 25 watts depending on the coil installed. The eGo ONE VT adds yet another set of lights. Here, the red, white and blue lights denoting mode are positioned to one side and below the fire button. Another set of three white lights are positioned on the opposite side of the firing button and are marked H for High, M for Medium, and L for Low. This allows the user to select between three different setting in all three (W, Ni, Ti) modes. Selecting the mode is the same with this device as it was with the CT model. Switching to a different power or temperature setting is as simple as quickly clicking the fire button three times. In Low, the device supplies between 5 and 20 watts to the atomizer or a temperature of about 430-degrees Fahrenheit / 220-degrees Celsius. In Medium mode, the ranges are identical to the eGo ONE CT. In High mode, the ranges are 10 to 30 watts or 600 F/315 C. All of the wattage ranges are, of course, based on the coil installed with higher resistance coils receiving lower wattages. Ability to use standard coils, Ni200 coils, or Ti coils. Finish - 9/10 - Joyetech has been in the business long enough and it shows in the machining. I have had no visible flaws, machine oil scent, taste, or smell on any of the myriad devices I own. All of the devices assemble and disassemble easily. I deducted a point because I have received one janky drip tip, and I don't like the juice ports on the stock coils. Form - 8/10 - What's not to like about a tube with a button. It's easy to hold and available in a size for most every hand. The button being easy to gunk and hard to press from time to time looses a point for them as does the hard to read and decipher indicator light. I thought about docking a point for the really tiny juice viewing windows, but those have been corrected in later models. Function - 9/10 - In daily use, I've never been let down by these devices. In saying that I must point out that I almost always use the CLR heads, so the juice flow is no longer an issue. Not only would I replace these devices if I lost or damaged, I often recommend or gift them to people just starting vaping. I feel I can do that because of the 1 Ohm coil included in the kit (.5 is a bit much for a first time vaper), adjustable airflow, and the simplicity of operation.